Banja Luka, the second largest city in Bosnia-Herzegovina, is located along the Vrbas River in northern Bosnia. Banja Luka is a historical gem, and despite its tumultuous history, retains a natural beauty that visitors have begun to rediscover. 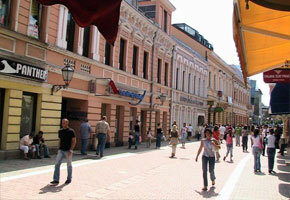 Banja Luka has a continental climate, making it ideal for travel in the summer months. Warm weather and surrounding woodlands make it tempting for nature enthusiasts and hikers to head out and explore, but they mustn’t forget about the central city of Banja Luka. It combines a warm student atmosphere with a rich culture that offers a tiny bit of diversion for every traveler. Banja Luka does have an international airport, so rest assured! You can arrive by air, although you are advised to plan your itinerary in advance. Fly from Zurich, Switzerland, or Istanbul, Turkey a few times a week to enjoy your stay in Banja Luka. For the classic European travel experience, get to Banja Luka by train. You can connect from points in Europe, Belgrade, Serbia or Zagreb, Croatia to reach Banja Luka. If you are feeling up for a challenge, try the international bus service from Slovakia, Germany, Croatia, Italy, France, or Austria—just to name a few! If you like to meet people when you’re traveling, the bus is the best way to do it. When you arrive in Banja Luka, you’ll want to have a stroll and see what the city offers. It has an incredibly rich mixture of preserved architecture and slightly aged relics that give Banja Luka a unique charm. You won’t want to miss Banski Dvor, the Halls of Ban, which was actually built as a stately home for the Ban family. Today, it houses the National Assembly, concert hall, gallery, and restaurant. You can schedule an entire day’s worth of cultural activities there, and once you see this beautiful, centrally located building, you’ll want to. Other stops in Banja Luka could include the Kastel Fortress in the city center. Located near the picturesque Vrbas River, you can enjoy a quiet meal with an outstanding view. You’ll have a lot of opportunities to record breathtaking panoramic views, so just don’t forget your camera! If you are new to Banja Luka, take a taxi for a no-hassle experience. There are very economical and are especially helpful for those getting to know the city. If you are feeling more adventurous, try taking the bus. They may be crowded, but you will get where you need to go for even less—and blend in with the locals! The Republika Srpska is known for its friendly people, and Banja Luka is no different. Explore the local houses and suburbs for a taste of true local life, and try to schedule a home stay or visit while you’re there.